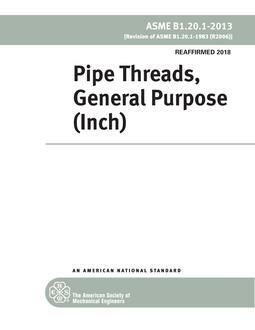 Dryseal pipe threads are based on the USA (American) pipe thread, however, they differ from the USA (American) pipe thread in that they are designed to seal pressure-tight joints without the necessity of using sealing compounds. To accomplish this some modification of thread from and greater accuracy in manufacture is required. The roots of both the external and internal threads are truncated slightly more than the crests, i.e. roots have wider flats than crest, so that metal-to-metal contact occurs at the crests and roots coincident with or prior to flank contact, see Figure 1. Thus as the threads are assembled by wrenching, the roots of the threads crush the sharper crests of the mating threads. This sealing action at both the major and minor diameters tends to prevent spiral leakage and makes the joints pressure tight without the necessity of using sealing compounds, provided that the mating threads are in accordance with standard specifications and tolerances and are not damaged by galling in assembly. The control of crest and root truncation is simplified by the use of properly designed threading tools. 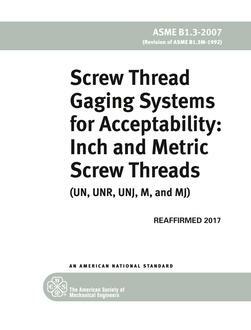 Also, it is desirable that both external and internal threads have full thread height for the L1 length. However, where not functionally objectionable, the use of a compatible lubricant or sealant may be used to minimize the possibility of galling. This is desirable in assembling Dryseal Pipe Threads in refrigeration and other systems to effect a pressure tight seal.